George Selgin has a post arguing that even modest deviations of nominal GDP from trend can lead to "booms." 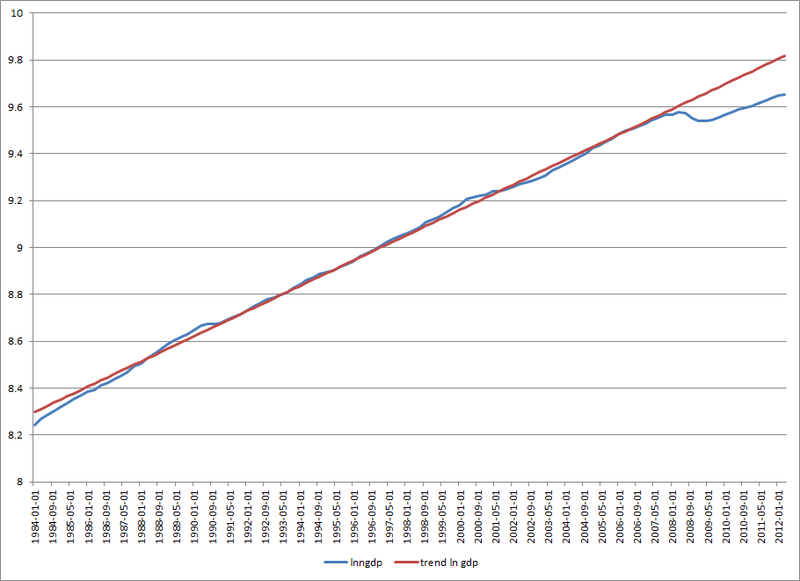 He provides the following graph. 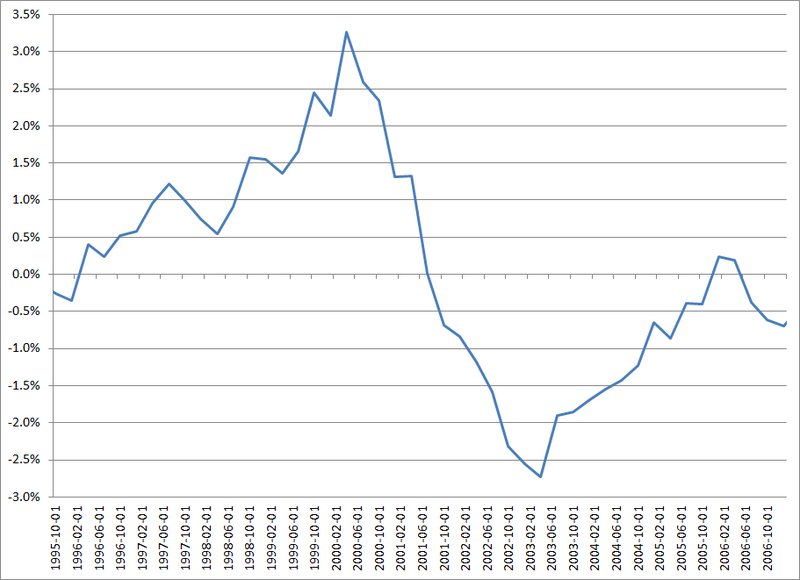 I generated this trend using the natural log of nominal GDP from first quarter 1985 to fourth quarter 2007. It looks to me like the actual value of nominal GDP just barely kisses the trend in 2005 before its growth rate slowed. It looks about the same. I then graphed the nominal GDP "gap," which is the difference of nominal GDP from trend. The Dot.Com boom was associated with a large upward deviation of nominal GDP from trend that reached slightly more than 3 percent in the second quarter of 2000, and then rapidly collapsed. The gap had turned negative by the fourth quarter of 2001, and reached a -2.73 percent by the second quarter of 2003. And so, what about the housing boom? Well, it does peek above trend, sure enough. It was slightly less than 1/4 percent above trend in the first quarter of 2006 and continued above trend, a bit less than 1/5 of a percent in the second quarter of 2006. Both the quarter before and the quarter after, the shortfall was greater. At first I assumed that Selgin must have used some different time period to generate the trend, but right there on the chart it says the growth rate is 5 percent. Well, the trend for nominal GDP during the Great Moderation was 5.4 percent, so that explains the differences in the diagrams. I realize that Sumner advocates a 5 percent growth path, but I don't try to understand what happened in the Great Moderation by comparing the actual trend to Sumner's preferred target. I favor a 3 percent growth path, and so, the nominal GDP growth during the Great Moderation was far above what I consider ideal. 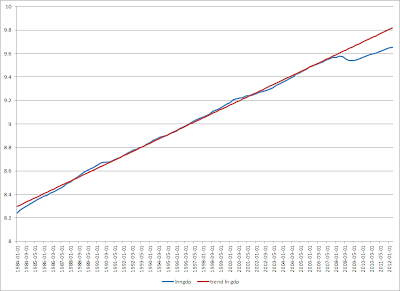 Still, I think shifting down to my preferred growth rate would likely create the usual disinflationary disturbance. More to the point, I don't think that the many quarters with nominal GDP growing more than 3 percent involved an excess supply of money. Such distortions can be significant even when they don’t involve exceptionally rapid growth in nominal income, because measures of nominal income, including nominal GDP, do not measure financial activity or activity at early stages of production. When interest rates are below their natural levels, spending is re-directed toward those earlier stages of production, causing total nominal spending (Fisher’s P x T) to expand more than measured nominal income (P x y). Assets prices, which are (appropriately) excluded from both the GDP deflator and the CPI, will also rise disproportionately. It is the possibility that such asset price distortions may significantly misdirect the allocation of financial and production resources that lies at the heart of the "Austrian" theory of boom and bust. But what about intermediate goods? These goods are produced and then used up in producing some other good. Since basic GDP accounting requires that intermediate goods be "netted out," this might suggest that an excess supply of money matched by an excess demand of such intermediate goods would fail to show up in nominal GDP. But this is a mistake. Intermediate goods show up as part of inventories. When a steel firm produces steel and hasn't sold it yet, the dollar value of the steel is part of nominal GDP. If a car manufacturer purchases the steel, and has yet to produce any cars with it, then the dollar value of the steel counts as nominal GDP. (Not twice, of course, but only once.) If the car company makes engines with it, the steel is included in the value of the engines, even if the engines are left sitting about waiting to be assembled into cars. Now, inventories are not included in Final Sales of Domestic Product or Final Sales to Domestic Purchasers. That is one reason why those are not the proper measures of spending on output. None of these measures, of course, measure the prices or quantities of financial assets. However, if the concern is distortions in the allocation of resources, the production of inappropriate specific capital goods, and the pattern of employment, it is unclear that financial assets (or raw land or other nonreproducible real assets) matter. Missing in both perspectives is any attention to the way in which interest rate movements redirect demand from certain markets to others. Now, I believe that an excess supply of money typically reduces the market interest rate below the natural interest rate in a credit money system. And I also think that lower interest rates raise the demands for goods with a higher interest elasticity of demand more than other goods. But that isn't a "redirection" of demand. The demand for other goods and services, with smaller interest elasticity of demands, just have smaller increases in demand. Of course, there is a distortion in the composition of demand, but an excess supply of money and a market interest rate below the natural rate doesn't cause demand to fall for some goods as would be the situation with a tax and subsidy scheme. Market Monetarists have been especially interested in situations where nominal GDP is below trend (or target) and an expansionary monetary policy is aimed at getting nominal GDP back up to the target growth path. In those situations, the point of the monetary policy is to create a nominal "income effect." Market Monetarists insist that nominal and real interest rates can be expected to return to equilibrium once this is accomplished, and so, can immediately begin to rise due to that expectation. In 2003, nominal GDP was far below trend, and an expansionary monetary policy could return it to trend. It barely made it back to trend. Of course, the Fed wasn't targeting nominal GDP at all, but rather inflation and the output gap. And they were doing this by making periodic adjustments in a policy interest rate. Such a policy almost seems tailor-made (or is it Taylor-made) to create the problems that concern Selgin. If instead, we had a central bank that was targeting nominal GDP, it is inevitable that mistakes would be made. An excess supply of money could develop and the market rate could be pushed below the natural rate. Only later would spending on output (including capital goods, partially finished goods, and inventories of intermediate goods) begin to rise above target. Would those firms that faced what turns out to be an sustainable rapid increase in demand commission specific capital goods (say construct buildings) and hire workers? Certainly that seems possible. However, to the degree this is caused by "low interest rates," these interest rates must be expected to persist into the future. Too much Austrian analysis just assumes that everyone takes any change in the policy interest rate as permanent and uses it as a reasonable basis for making long range plans. Isn't the most likely scenario one in which both the monetary authority and entrepreneurs make the same error? Perhaps they all believe there has been a permanent decrease in the natural interest rate. Or, perhaps the problem is that the natural interest rate has increased, and both entrepreneurs and the central bank have failed to see it. Market Monetarists, like Sumner and I, who are interested in index futures targeting, have in mind a system where monetary policy is generated by the market. If those trading the index futures, bond investors, and entrepreneurs all think that the natural interest rate has fallen, then it is quite possible that unsustainable investments will be made before excessive growth in spending on output shows that no, the natural interest rate was not as low as everyone thought. But would such errors be especially the fault of those trading the index futures? Wouldn't those holding long term bonds also be a fault? And how about entrepreneurs that initiate projects that are only feasible if interest rates remain low? Anyway, I think there was a housing bubble. The list of things that increased the demand for homes was legion. The tiny overshoot of nominal GDP in 2006 seems like a pretty small problem in comparison. What if the housing bubble was a waste of resources that reduced trend real GDP growth? Shouldn't trend NGDP then have fallen too? And thus a 5% NGDP path 2003-2007 be highly dangerous and requiring a serious correction? 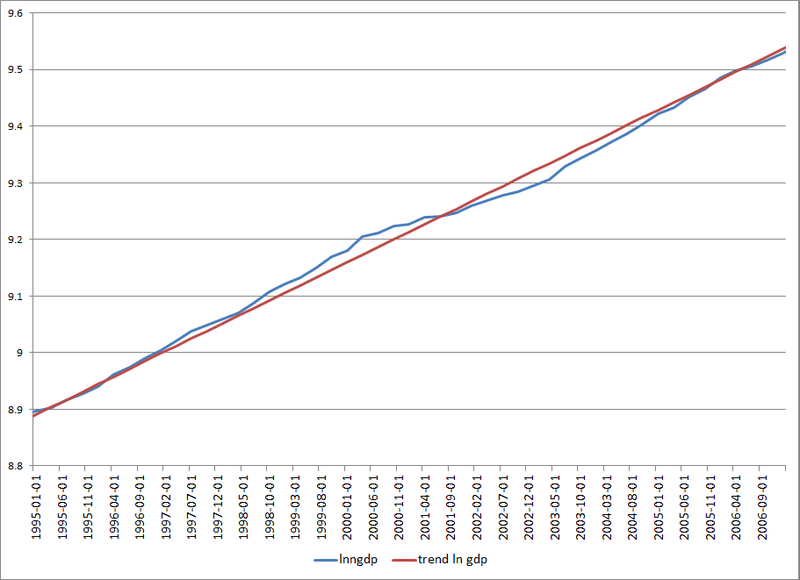 Just drawing a 5% trend on top of actual NGDP seems arbitrary, and no proof of what the actual trend should have been. If the housing bubble wasted resources, then it would reduce potential output. But now, that isn't a reason to reduce the growth path of nominal GDP. There is nothing dangerous about it, and as far as I can tell "correction," is a term from "technical" stock analysis. No connection to economic fundamentals. If the housing bubble wasted resources, and this reduced the growth path of potential output, then a constant growth path of spending on output results in a higher growth path for prices. This involves a transitionally higher inflation rate, and then inflation returns to its previous trend. The 5.4 percent trend over the more than 20 year Great Moderation is not the same thing as just choosing the peak of a housing boom. You need to understand that it is possible to have an inflationary equilibrium. Most spending is funded by current income (and all of it can be,) and income is generated by current expenditure. I guess that remains a fundamental difference between us. Your confidence in thinking that there is such a thing as an equilibrium in anything other than a closed theoretical model of an economy versus my lack of confidence when looking at the real world as it is with so much complexity and uncertainty. That is why I am a Hayekian and you are a Monetarist. The "20 year Great Moderation" is just one short historical episode that is open to numerous interpretations. It probably has more to do with the great opening up of the communist east (Russia and China) and a general de-regulation of other extremely statist countries like Brazil, India and Indonesia that the smart monetary policy of Greenspan. That's not to say I don't have some sympathy with the MM view that monetary policy in response to clear macro-shocks can sometimes be appropriate. Long-term rules monetary rules are much, much more problematic given the overall level of noise in macro-economic statistics. So Bill do you feel more capable than Scott of explaining why the housing bubble happened? What do you know that he doesn't? I don't _know_ anything more than Scott, and I am not _aware_ of anything about which Scott is unaware. Still, I believe there was a bubble in housing. My view of the world is one of constant Schumpeterian change. I think malinvestment is a constant reality. Malinvestment due to excess supplies of money are at most a drop in the bucket. There is more of Lachmann than Hayek in my perspective on capital and capital markets. So, the concept of an "inflationary equilibrium" should not be understood to mean that all plans are always coordinated through time. That has nothing to do with reality. It is just that there are not persistent excess supplies of money, the market rate isn't persistently below the natural interest rate, and there is not obvious pattern of unsustainable distortion towards production for the more distant future. Btw I'd just like to say that every comment you leave on Scott's blog is brilliant. But they are near the length of your blog posts, and I think many skip them, to their loss. And your single centered-column formatting makes your posts over here hard to read (other than that though, I enjoy reading you nearly as much as I enjoy Nick Rowe, which is saying something). I too have struggled to understand Austrian business cycle theory. I meant Hayekian in the sense of not believing in such macroeconomic concepts as "equilibrium", inflationary or otherwise. What do you mean by it? 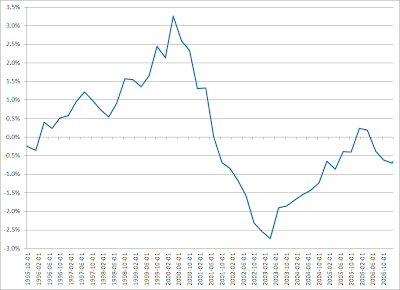 And anyway, how do you explain persistently high inflation except via persistent excess supplies of money? Interesting question. If prices were to remain stable, then there would be excess supplies of money. However, prices don't stay stable, they are increased based upon expectations of inflation. And when money growth matches the inflation, there is no excess supply of money. This is very interesting, we need to make sure we don’t do anything silly and work only when we are certain. I have been doing trading for past 3-4 years, I believe the best way to succeed for anyone is through patience and keeping emotions in control; if we do these things well then everything else will work rightly. I gain so much benefit with help of my broker OctaFX since they have amazing daily market news and analysis updates which are seriously useful. What Trend? 1991 or 1985?